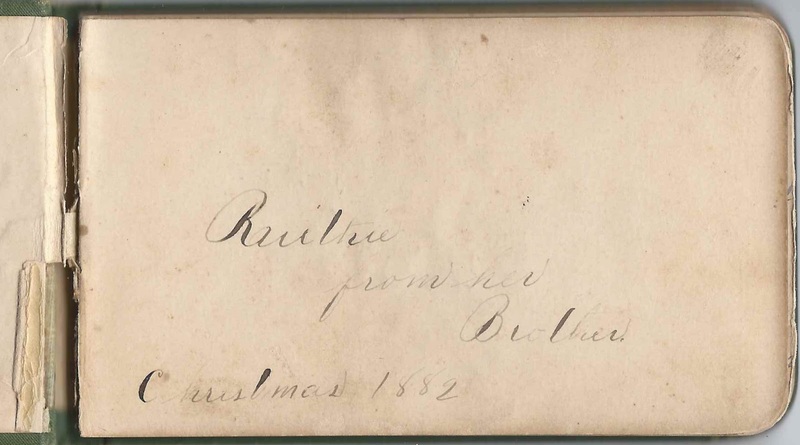 1882-1901 autograph album that belonged to Ruth Nina Partridge, "Ruthie", who was living at Fancy Gap, Virginia, when the album was presented to her at Christmas by her older half-brother Frederick Horn Partridge, Jr.. Their father was a minister and lived in various places while Ruth was growing up, including Indiana and her native state of New York. 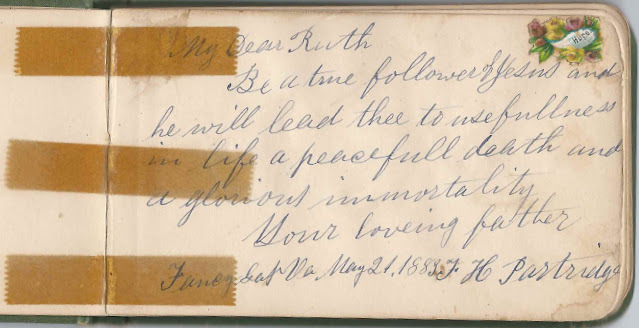 The album is a small one, measuring about 5-1/2" x 3-1/4", and contains pages signed by 15 of Ruth's relatives and friends. An alphabetical surname list and an alphabetical list of signers, complete with any personal information they shared, appear at the end of this post. 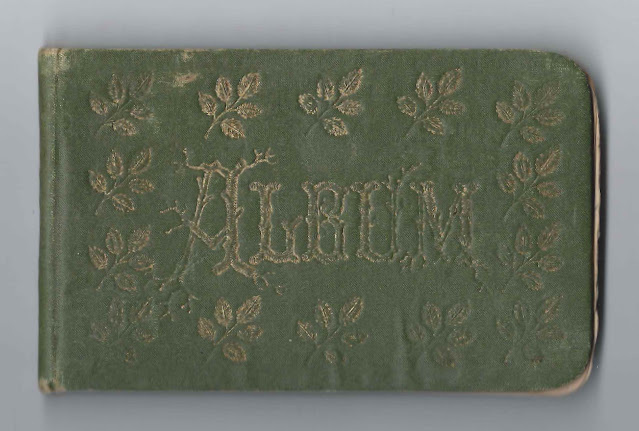 The album contains several Victorian scraps. Ruth Nina Partridge was born 31 December 1871 at Putnam, New York, the daughter of Rev. Frederick Horn Partridge and his third wife Mary Jane (Peabody) Partridge, who were born in Ohio and New York, respectively. Rev. Partridge was married previously to Mary Eastman (Root) Partridge, who was born in 1822 at Royalton, Vermont, daughter of Stephen Eastman Root and Hannah (Moxley) Root. They married at Lowell, Massachusetts, on September 14, 1848 and had, I think, six children, one of whom was Ruthie's older half-brother Frederick Horn Partridge, Jr., mentioned above. Mary died April 14, 1863 at Putnam, New York. On September 4, 1863 Rev. Frederick Horn Partridge, Sr., married his second wife, Judith Lenfest Getchell, who was born at Pittsfield, Maine, on May 19, 1829, daughter of Samuel and Judith (Lenfest) Getchell. Judith had a daughter before dying as the result of a subsequent childbirth in October 1869 at Bloomfield, Minnesota. The daughter, Mary Judith Partridge, was born March 12, 1868 at Fillmore, Minnesota, and, sadly, died May 20, 1873 at Chelsea, Vermont. On 9 April 1871, Rev. Frederick Horn Partridge, Sr., married again, to Mary Jane Peabody, who was born June 29, 1850 at Dresden, New York, daughter of William and Mary Elizabeth (Pease) Peabody. Mary Jane would have, I believe, three children, including album owner Ruth Nina Partridge. Rev. Frederick Horn Partridge died on January 3, 1885 in North Carolina and is buried at Greenlawn Cemetery at Orland, Indiana. One the 1880 Census, it's mentioned that he suffered from asthma. Perhaps he had moved around in search of churches to pastor based on his need for a better climate. About 1899, Ruth Nina Partridge married Charles David Lalonde, who was born in either upstate New York or over the border in Canada. At the time of the 1900 Census, they were living at Woonsocket, Rhode Island, with their newborn daughter Mildred Genevieve Lalonde. By 1910, Ruth and Charles were divorced and Ruth and daughter Mildred Genevieve Lalonde were living with Ruth's widowed mother Mary Jane (Peabody) Partridge and Ruth's sister Genevieve Moore Partridge, for whom I assume Mildred Genevieve Lalonde was named. The four were still living together at the time of the 1920 Census of Woonsocket, Rhode Island. I found Ruth in as late as a 1954 Directory of Woonsocket, Rhode Island. She died on October 5, 1967 at Dorchester, Massachusetts, and is buried at Union Cemetery in North Smithfield, Rhode Island, where her mother is also buried. Emma Barber of Orland, Indiana, signed on March 10, 1886; her younger sister Bertha also signed a page. 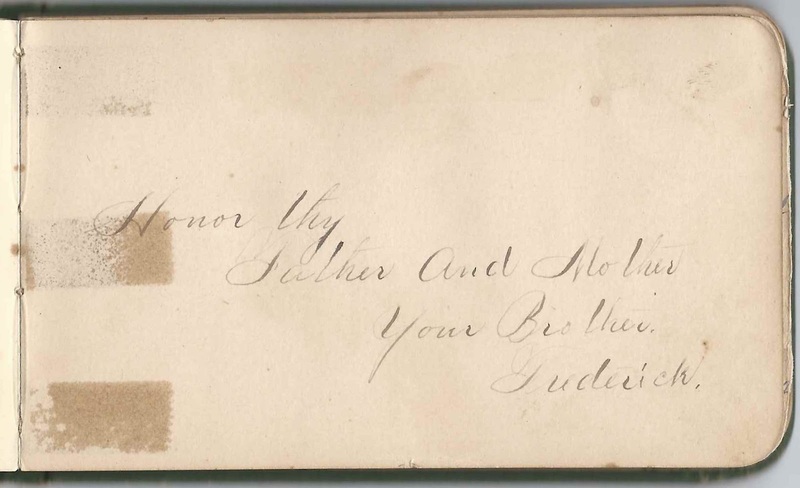 Bertha Barber; her older sister Emma of Orland, Indiana, also signed a page. 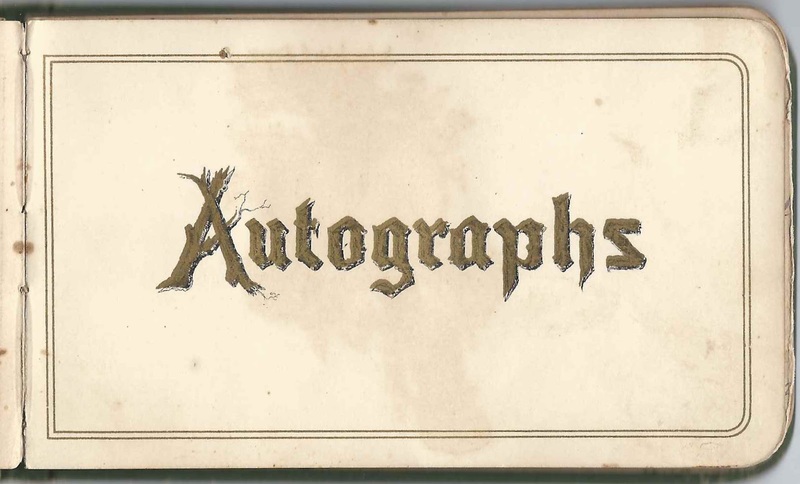 Mrs. E. Newell, signed at Putnam, presumably Putnam, New York, on March 9, 1887. Her husband Rev. 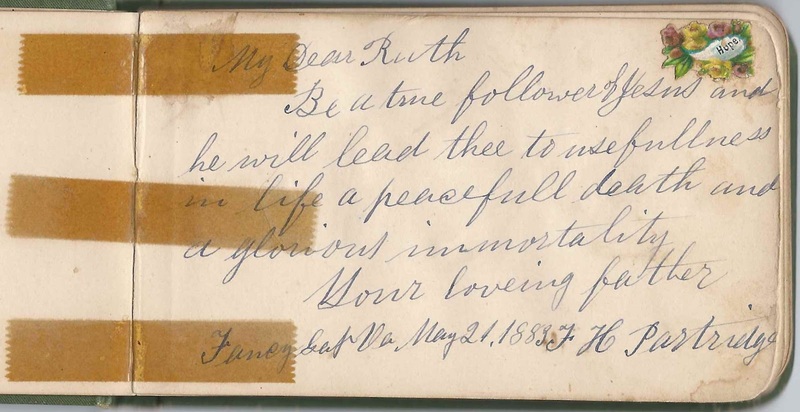 Newell, Ruth's pastor, signed the following page. E. Newell, signed March 21, 1887. "Your Pastor"; presumably Rev. E. Newell, a native of Huntington, England, whose wife signed the previous page. "Honor they Father and Mother. Your Brother, Frederick"; Ruth Nina Partridge's half brother Frederick Horn Partridge, Jr.
F. H. Partridge of Fancy Gap, Virginia, signed on May 21, 1883. Ruth Nina Partridge's father Rev. 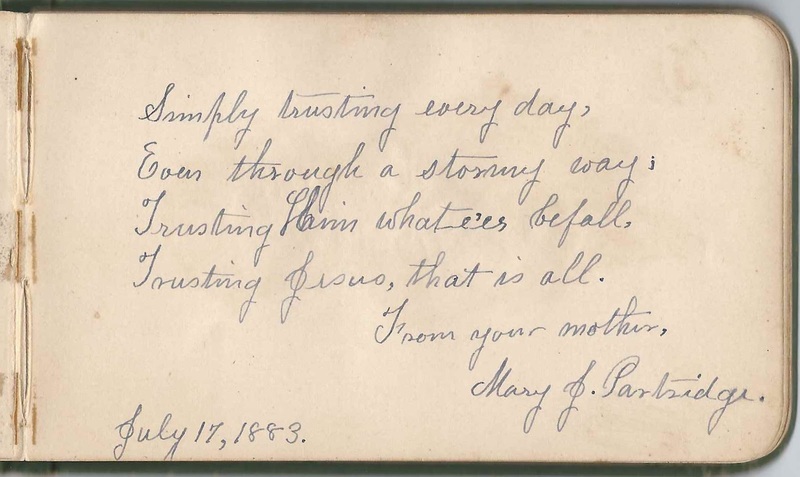 Frederick Horn Partridge, Sr.
Mary J. Partridge, signed on July 17, 1883;. Ruth Nina Partridge's mother Mary Jane (Peabody) Partridge, third wife of Frederick Horn Partridge, Sr.